"My grandson is a genius!" explains Grandpa, the proud if heartwarmingly oblivious narrator and baby-sitter of the titular two-year-old. 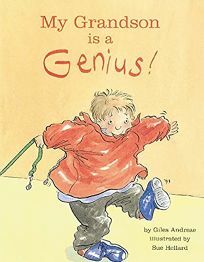 "It's plain for all to see,/ I'm sure it won't be long/ Before he gets a Ph.D." Indeed, if Nobel Prizes are awarded for spreading jelly in the VCR, howling in the grocery store, splashing paint and putting food on one's head, this kid's a shoo-in.